This Sunday morning, at eleven o’clock, you may hear the ringing of church bells pealing out over the state. This tribute marks the centennial of Armistice Day – the end of World War I, which occurred on the eleventh hour of the eleventh day of the eleventh month– November 11, 1918. Nowadays, we celebrate November 11 as Veteran’s Day – a holiday to acknowledge the impact and efforts of all of our nation’s veterans. This year, however, it seems appropriate to draw special attention to the history and legacy of World War I – or the Great War as it was called then. It is impossible to over-state how significant World War I was to our country. Beyond the military events, the War impacted our economy, our transportation system, our politics, and our culture. One of the greatest legacies of the War was the impact on the development of the American Red Cross. Though the American Red Cross was founded in Washington D.C. in 1881, its presence and impact throughout the nation had been sporadic. During its first three decades, local and national Red Cross volunteers had responded to floods, droughts, fires, earthquakes, and the Spanish-American war of 1898. By the 1910s, the organization was muted – and the Minnesota Red Cross chapters were frail- if they existed at all. World War I changed that. Within weeks of the U.S entering the war, the critical importance of the Red Cross was evident. In May 1917, the Red Cross was placed under the direction of President Woodrow Wilson’s War Council, which directed organizations and industries needed in the war effort. 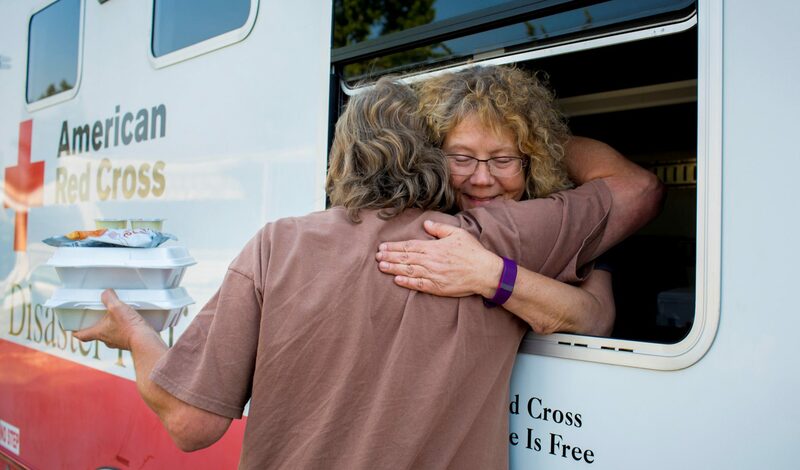 Across the nation, millions of people donated and signed up to volunteer for the Red Cross. In Minnesota, hundreds of thousands joined the Red Cross. They stepped forward in a spirit of can-do optimism, loyalty, and sacrifice. Most of those worked locally, but others served overseas. Locally, Red Cross volunteers operated canteens for soldiers at the railroad depots, offered support to soldiers’ families, and organized recreation events for soldiers at Fort Snelling. They offered classes in First Aid, Elementary Hygiene, and Home Dietetics. For overseas, Minnesota members sponsored Base Hospital No. 26 in Allerey, France, and raised nearly $50,000 to supply the hospital with equipment and bandages. Members sent new and used trucks, ambulances, and cars to Europe. In addition, volunteers produced 5,842,078 surgical dressings, knitted 94,439 sweaters, produced 14,522 garments for refugees, and packed 38,551 “comfort kits” with shaving supplies, cigarettes, chewing gum, and other essentials. In addition to local efforts, hundreds of Minnesotans served as Red Cross volunteers in Europe. Red Cross volunteers established and offered service from 551 stations, including 24 hospitals and 12 convalescent homes for soldiers and 130 canteens. They established emergency depots of medical supplies for the American Army and for French hospitals. The Red Cross also produced and supplied all necessary splints, nitrous oxide anesthetic, and oxygen for the Army. There were also reconstruction and re-education efforts for crippled and disabled men, recreation and welfare service, hospital service, hospital farms and gardens, moving pictures for hospitals, grave photography, civilian relief, relief of French soldiers’ families, children’s relief, and anti-tuberculosis relief. The largest group of Red Cross volunteers was nurses, who faced particular dangers. Nurses Miss Anna M. Dahlby of St. Paul and Miss Mary H. Cummings of North St. Paul both died while on duty. After the war ended on November 11, 1918, the Red Cross continued to its war-related work. Overseas, the Red Cross helped at hospitals, camps, and transportation depots. Locally, Red Cross volunteers continued to staff booths at train depots to assist soldiers as they traveled home, and completed paperwork to apply for support services. While many Red Cross chapters shuttered or closed completely, other chapters in larger cities began to shift their attention to address issues such as public health (the Spanish Flu) and natural disasters (the Cloquet Fire). Both the St. Paul and the Minneapolis Chapters offered continuous service from 1917 on- and mark that year as their true foundation date. In Minnesota, many of the women who served overseas and lead local Red Cross efforts used their strengthened problem-solving, organizational, and networking skills to tackle local needs. Many became active in the Women’s Overseas Service League, and others took an active role in promoting the women’s right to vote and the passage of the 19th Amendment to the U.S. Constitution. Local museums, hospitals, libraries, schools, orchestras, and charities all benefited from this generation of generous and civic-minded women. In the decades since, the Minnesota Red Cross has continued to respond to both international and local needs, evolving to fulfill new roles such as blood services, and shifting out of old ones — no more knitting sweaters. When you hear the bells toll this Sunday, recall both the relief and joy at the conclusion of the Great War, but also mark the creation of the Minnesota Red Cross – and the spirit of optimism, loyalty, and sacrifice that continue to define us as Minnesotans. Nancy O’Brien Wagner is a local historian and author of Alice in France: The World War I Letters of Alice M. O’Brien. She is the proud granddaughter of two World War I soldiers, and great-niece of two World War I Red Cross volunteers. Previous PostPrevious What makes a hero?